In 2003, the US military ordered The Dual-Ended Combat Arms™ Earplugs, Version 2 (CAEv2) from Aearo Technologies. In 2008, 3M acquired Aearo Technologies and all its liabilities for $1.2 Billion. From 2003 to 2015, 3M supplied a maximum of 2.2 million ear plugs to the US military to use in war zones in Iraq and Afghanistan, as an exclusive supplier for the US military for ear plugs. This product was only sold to the military. The plugs were supposed to provide two levels of ear protection: one side was intended to block all noise and the other was intended to protect the eardrums from gunfire and explosions while still allowing soldiers to communicate freely. The failure dual-ended Combat Arms Ear Plugs (version 2) to protect soldiers’ ears has resulted in high incidences of tinnitus (ringing or buzzing of the ears) as well as partial or full hearing loss. In 2016, a Whistleblower lawsuit was filed under the “False Claims Act” by a competing Ear Plug manufacturer, Moldex Metric Inc. The lawsuit alleges that 3M and Aearo Technologies both knew the Ear plugs where defective, and they even setup bogus tests with fraudulent results to comply with U.S. military standards. In 2018, 3M settled the Whistleblower claim with the U.S. Department of Justice for $9.1 Million. 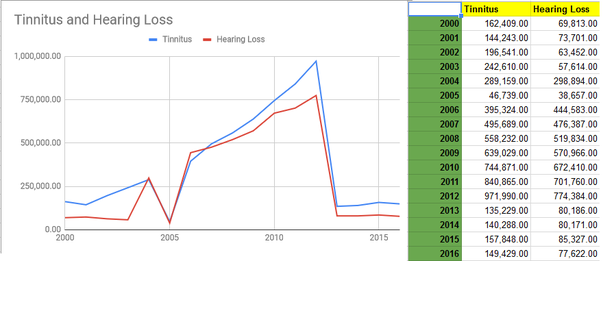 The chart below outlines the increase in hearing loss and tinitus claims made by veterans from 2003-2015 as reported by the Veteran Affairs office. Those suffering from hearing problems as a result of the ear plugs not working while in combat or training may be eligible for compensation as the manufacturer recently has come under fire for failing to disclose a design flaw that had been known as early as 2000. Those current or former military personnel should seek immediate advice from an experienced attorney as statutes of limitation dictate the amount of time they have to file a lawsuit against the manufacturer of the Combat Arms Ear Plugs to seek financial compensation. Please contact us today to begin your free, no obligation case review by calling toll free at 1-855-363-3100 or clicking here to complete our free online questionnaire.